a Class*y Collaboration: What are you carrying back to school? In celebration of all the Back to School posts, giveaways, freebies, Instagrams (etc! Whew...!) 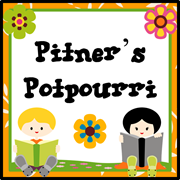 I am hosting a fun get-to-know you type linky party. I recently hosted on online Thirty-One party for my family and friends because Thirty-One is now in Canada!! Beyond excited...I bought 6 bags...crazy. I'd love to know what you carry to school. Is it big, small, sturdy, colourful, have wheels? How do you get all the necessary stuff to and from school? 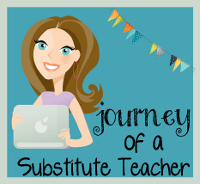 So come on by, link up and share your teacher bag (or bags, if you're like me)! I carry a canvas bag... it is sort of boring. It is brown and white and has my initials. I have no idea where it came from, it was a gift. I have almost worn a hole in the bottom though and will be looking for a new bag soon I'm sure. Interested to hear what other use since I'll be in the market. Thanks for commenting. It sounds like a new bag is needed for sure. 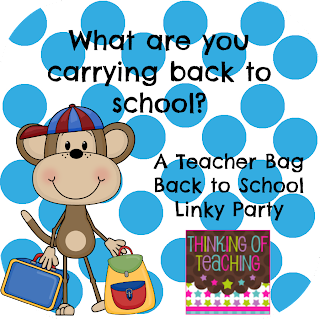 I'd love to see what you choose and to have you link up with a post over at Thinking of Teaching. You did!! I just came from your blog and am your newest bloglovin follower! I have a THirty-One bag- this will be my first year to use it... so excited!! Ohhhh, Dora! Take pictures and link up! I have to say I'm a little bias to Thirty-One since I LOVE the products and sell them! I carry a Cindy Tote to and from school each day and in my classroom I use the Large Utility Tote, Medium Utility Tote(you can't get this size at the moment it was a monthly special)and Little's Carry-All Caddy's in my classroom for storage, books and centers. They add color to my room and I can quickly wipe them clean! I also personalized the caddies for center numbers as well. I also use our lunch tote as well:) My principal actually ordered each staff memember a Little Carry All Caddy for EVERY staff member in our school colors from me for a back to school gift! You'll love your bags!! Oh my....I wish I could see your room! I love my work bag. Last year I splurged on a Michael Kors jet set tote with a laptop compartment. It really feels pulled together and limits the amount I can bring home!